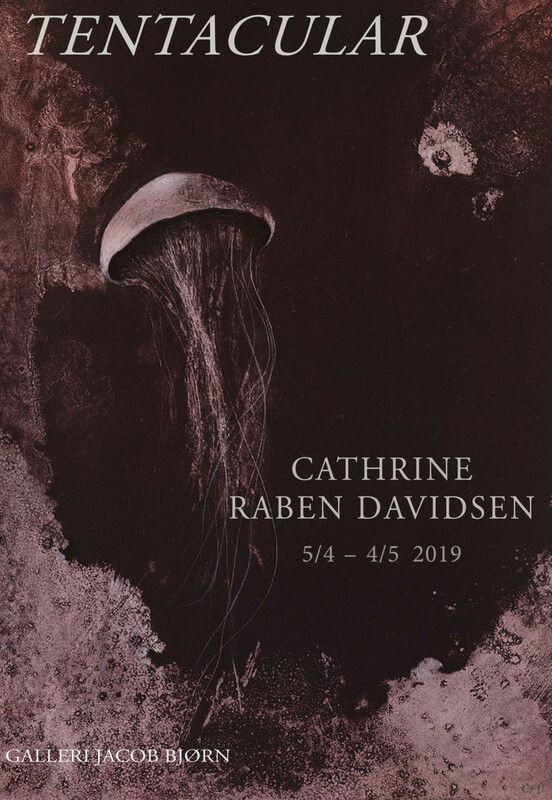 For TENTACULAR Danish visual artist Cathrine Raben Davidsen presents a series of drawings, prints and an animation film, all of which together expand her abstract visual language and reach beyond previous motif worlds. The prevailing subject matter in these works is the synthesis of human, animal and cosmos. We encounter shadowy images of ambiguous floating bodies, owls with pierced-out eyes, a young deer hovering in the air with its hooves growing like tree branches, lightweight birds, ethereal jellyfish and whales moving around in liquid, formless spaces. Raben Davidsen’s newly produced animation film Tentacular stands out in the exhibition as the only moving image. In the 4-minute black-and-white looping film, we see series of subtly drawn milky-white jellyfish, spreading out their umbrella-shaped bells as they appear and disappear like magical ghostly creatures. Adding more layers we see figures, birds, spiders and plants performing the same organic movements, from physical dissolution to cosmic integration. The animation is accompanied by an underworld-like soundtrack and takes the form of a meditation on transformation. Throughout her artistic career, the work and practice of Raben Davidsen has gravitated towards the larger existential questions of human life and death. Understanding life as an imminent process of continuous transformation, Raben Davidsen explores the essential traits of being human, asking not only how we as humans are connected to each other, but also how these connections extend towards other living organisms and earthly entities. With an elementary curiosity that connects the knowledge of the past with present-day thinking, Raben Davidsen proposes to us, through her art, to broaden and diversify our sense of historical continuity. Caring little about the traditional hierarchies among fine art, craftsmanship, design and other creative disciplines, Raben Davidsen is concerned in her artistic oeuvre with multiplicity and intertextuality. Drawing on a wide variety of visual and philosophical references – implementing both modern and renaissance art history, ancient mythology, non-western religion, science, 20th century feminist literature along with personal experience – Raben Davidsen juxtaposes loosely connected elements from diverse cultural realms. Her works most often take form as paintings, drawings, prints or ceramics, but she also engages in collaborative formats such as costume-making, stage and lamp design, and artist books. In recent years, Raben Davidsen has focused her interest on how we perceive and understand mankind’s relationship with nature. She reflects on the modern loss of spirituality and contemplates how we can better pass on the worldly wisdom of ancient epistemologies that are not influenced by the dominant paradigm of Western capitalism.